The vibrant colors and textures of lemons, limes, oranges and grapefruit make inspiring fresh color palettes. A pop of citrus adds a boost of energy to any outfit, and you can’t help but feel happiness when surrounded by these juicy hues. What do you think of citrus inspired outfits? 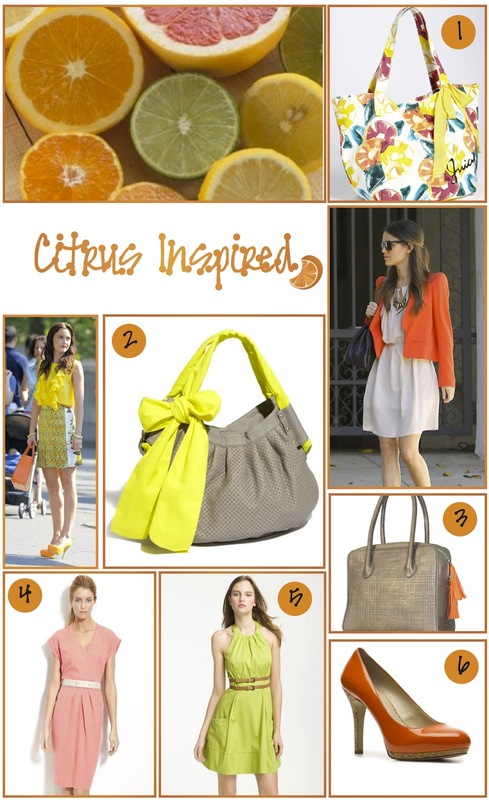 That bag is the sweetest with that adorable bow- I am loving citrus colors as well! I'm loving those shoes! AND I'm wearing my tangerine sweater today! great minds think alike! I love that bag (#2)! The bow is just so cute! Great inspiration! I love citrus shades! I'm loving the citrus shades right now! That #2 bag is just adorable! I love the bright pops of color. So fun! I love the citrus colors, especially the lime green....Gorgeous!! those are all so fun!! I want that reddish blazer and that bag!! love all your citrusy picks. dress #4 is so cute.